Thinking of making your child’s birthday, or perhaps your own, a special one? Don’t just throw a party, make it a McDonald’s® party! Party Invitation Cards will be handed to each birthday celebrant to invite his or her friends. All invitees will receive gifts, a Happy Meal® of their choice, as well as prizes to win from games. To top it off, a specially made birthday cake (optional) and an exclusive gift awaits the birthday celebrant. The best parties are all made of these! Book your party at selected restaurants only. For more details, visit our Party FAQs page. We've prepared a list of Frequently Asked Questions for your convenience below. Feel free to speak to any of our Restaurant Managers at participating Birthday Party restaurants, and they'll gladly assist you in planning the best party. Q: Can I conduct a party at any McDonald's® restaurant? A: Unfortunately, not all McDonald's restaurants are party stores. 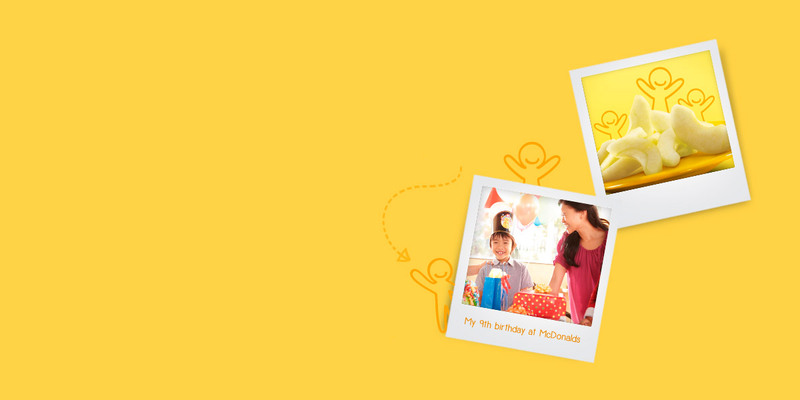 Visit this link (https://www.mcdonalds.com.sg/locate-us/#:/birthday-restaurant) for locations of Birthday Party restaurants, to see if your store in mind is a birthday party restaurant. Q: What do I need to do to organise a party at McDonald's? A: You'll need to decide where you would like the party to be held or if you would like a takeaway party to celebrate on your own. Next, approach a Restaurant Manager at our participating Birthday Party restaurants to make your party booking. It's that simple. 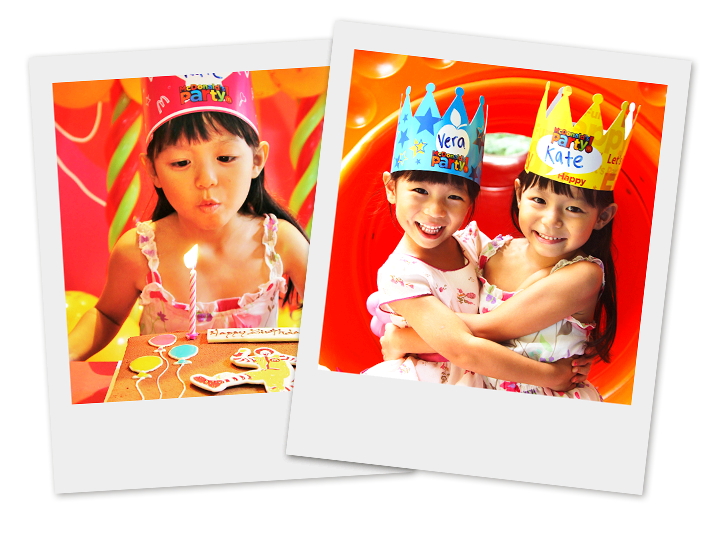 Visit this link (https://www.mcdonalds.com.sg/locate-us/#:/birthday-restaurant) for locations of Birthday Party restaurants. Q: What does the standard McDonald's® party package include? * The party package applies to both Indoor and Takeaway Parties. Q: How much does it cost to have a party at McDonald’s? * A $30.00 non-refundable deposit will be charged for both Indoor and Takeaway Parties upon confirmation of booking. Q: Does the package include a birthday cake? A: No, the package does not include a birthday cake. The Ronald McDonald's birthday cake (700g) is available for order at party hubs for $26.00. Q: What does the birthday cake look like? A: The Ronald McDonald's birthday cake is a chocolate cake. A “Happy Birthday” sign is hand drawn in chocolate while the balloons and image of Ronald McDonald are printed on white chocolate. Everything on the cake is 100% edible. Q: Can I bring my own cake instead and place it in your storage facility? A: You may choose to bring your own birthday cake and consume it within our restaurant premises as long as it is certified Halal. However, we do not allow outside food to be kept in our storage facility due to food safety reasons. Q: How many guests can attend? A: A minimum booking of 15 guests is required. The size of group may be limited by party venue. Our Restaurant Managers can assist in this regard. Q: Are there any age restrictions for guests? Can adults have parties at McDonald's® too? A: There are no age restrictions. Yes, adults are welcome to throw parties at McDonald's®. Adults can relive their childhood and experience the same games, activities and gifts as kids do! Q: Will guests receive gifts? A: Yes, all invited guests will receive surprise gifts. There will also be game prizes to be won. Q: How long will the party last? A: The standard package party will last for about 1½ hours. Q: By whom will the party be run by? A: Our specially-trained Party Hosts will run the party as you relax and enjoy yourself. Q: How is the party conducted? A: The Party Host will usually start off with games for about 30 minutes. Food will be served thereafter, followed by birthday cake-cutting. Finally, presents will be given out to the birthday celebrant and all guests. Q: When can I book the party? A: Booking arrangements need to be made at least 2 weeks before the party date, subject to availability.